We have already heard that pure silt soil have no particles that have attraction and shows inert property. But the actual condition is not the same, in most cases, it shows identical properties, not in same degree, of clay. They frequently show cohesion like clay which is due to the impurities, sometimes called contamination of silt with clay. When a foundation bed has clay particles, a foundation engineer becomes conscious about problems associated with settlement and strength. Being similar properties, silt is also a suspicious soil. Throughout last two posts, we have discussed about differentiating silt from other soils and from sands. We will discuss about differentiating various types of soil from each other in this blog. Here our concern is clay but organic materials also render cementation properties to silt which will be discussed in upcoming posts. Depending of above factors a mere (5-8) percent of clay content render a deposit of silt to behave like clay with sufficient cohesion. 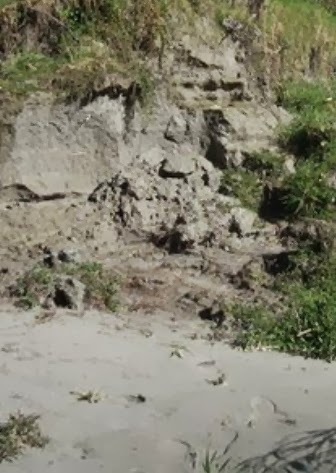 When higher percentage of clay is found in clay or based on visual effects, sometimes silt is called clay, especially in foundation construction personnel.